A Darlington woman who helped save the life of a three-year-old girl injured in an accident with an inflatable artwork is in line for an award. Jane Peacock, from Middleton St George, was at the scene of last year's tragedy in Chester-le-Street as a paramedic with the Great North Air Ambulance. Her quick action meant the girl was able to receive life-saving treatment. Ms Peacock has been shortlisted for the North East heat of the annual Vodafone Life Savers Awards. Her entry will now go before a regional judging panel, and if successful before a national judging panel. The overall winners will be presented with their awards during a reception at 10 Downing Street. 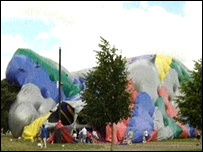 Two people were killed when a huge inflatable piece of art work broke loose from its moorings in a park in Chester-le-Street last July. Many others were injured including Rosie Wright, who sustained life-threatening leg and head injuries when she was tossed into the air and a generator landed on top of her. Jane Peacock was aware that she needed life-saving drugs which were carried by the air ambulance but could only be administered by a doctor. In the crowd of onlookers, she recognised Dr Peter Evans, a consultant anaesthetist who had trained her on part of her paramedic course. She called him across, enabling Rosie to receive early intervention. The child was taken to hospital and has since made a full recovery. Julien Cozens, from Vodafone UK, said; "Modesty is a very British trait and anyone who has shown extreme courage should be recognised. "We want to make sure that acts of bravery, such as Jane Peacock's, do not go unnoticed."